Whatever the JC part of the old Penney store downtown on 5th Avenue used to stand for, now the initials mean Justice Center, and art students at Roosevelt High School were commissioned by the Polk County Board of Supervisors to help repurpose the building. Chiodo, James, and their colleague Jeana Goldman are taking turns covering each other’s classes to shuttle rotating shifts of students to and from the site. The 2nd floor of the new Justice Center houses the Polk County juvenile court offices and courtrooms. Besides making their lasting mark on a major public institution, the Roosevelt artists received a $5,000 award. County supervisors Matt McCoy and Angela Connolly interrupted the project on Wednesday to deliver the check. Artists typically don’t appreciate having their shoulders looked over while their work is in progress, but when their patrons bring checks, exceptions are happily made. James said the county’s vision was a depiction of cultural diversity. 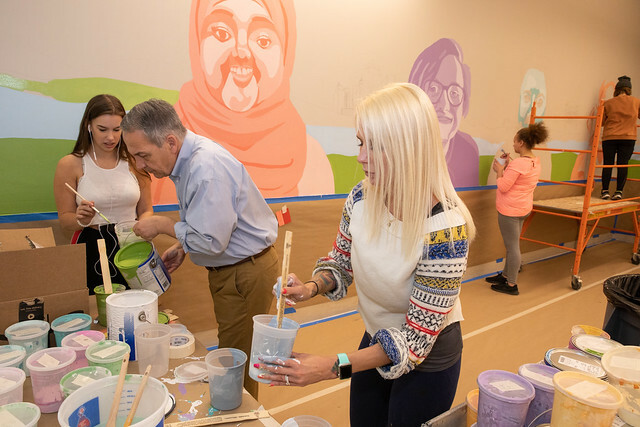 Her interpretation of that is expressed in terms of both people and places in the mural that’s rapidly taking shape on the walls of the Justice Center. The backgrounds for a collage of student faces range from the rural Iowa countryside to the Des Moines skyline. Lady Justice is supposed to be blind, but the people who come to her courts on the 2nd floor at 222 5th Avenue will see themselves reflected there. “Thank you for this opportunity to display our work in public,” said Chiodo to McCoy and Connolly, who both raved about the quality and pace of the project. “Do you have any questions for us?” Connolly asked him, after lavishing the artists with praise. “Well, what’s next?” Chiodo responded, chuckling.